The World Startup Report is a social project to help understand and connect the different startup ecosystems in the world. 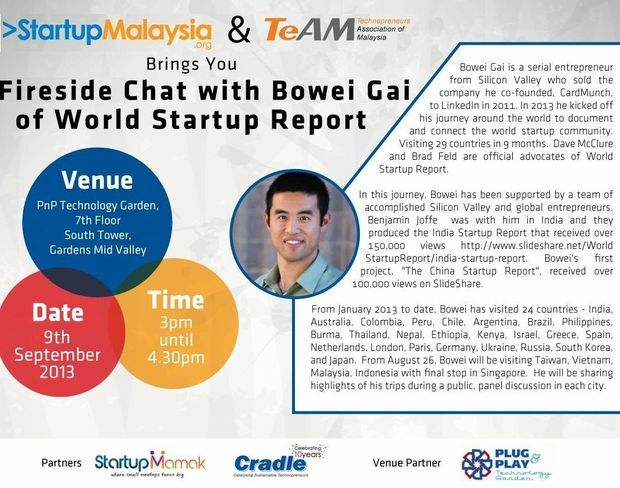 This event will feature a panel discussion, moderated by Bowei Gai - a Silicon Valley serial entrepreneur and initiator for the World Startup Report - about what it is like to be involved in a startup in Kuala Lumpur. What are the perks, possibilities, and pitfalls of this city in particular? A panel representing different perspectives and roles within the local startup ecosystem will answer questions of this nature, as well as any questions contributed by the audience in a Q&A session. Nepal: Heavily dependent on foreign aid because only 4% pay taxes. Greece: 50% of the companies we met are in the travel industry. Israel: Startups here are on a different level than most of the world. Germany: No soft drinks here, only beer. Ukraine: Never seen so many Porsche Cayennes. How are people so rich here? Korea: Startups place heavy emphasis on aesthetics. Many are surprisingly polished even at early stage. Taiwan: Mark Zuckerberg wouldn't be able to work here - he doesn't have a degree. Vietnam: Has its own AppStore because virtually all iPhones are jailbroken.